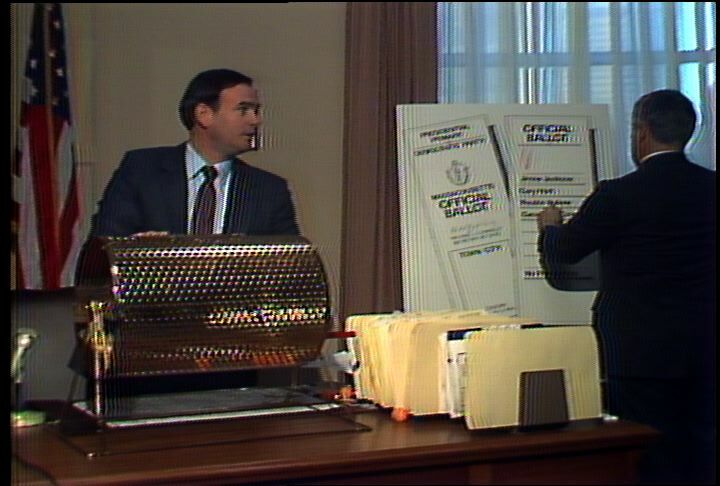 Description: Michael Connolly (Massachusetts Secretary of State) draws names from a spinning drum to determine the order of the names of the Democratic presidential candidates on the Massachusetts primary ballot. State officials Thomas Fitzgerald, Paul Williams and others draw names. Jesse Jackson gets the top position on the ballot; Connolly comments on Jackson's popularity with voters. Connolly endorses Walter Mondale; says that press conference was organized in order to raise voter awareness and to promote voter registration. Connolly tells the press that he expects to run for the US Senate. Kate McGrath (WGBH reporter) stands outside of Connolly's office to report on Massachusetts Presidential primary elections. 0:59:55: Visual: Shot of a large sign with an image of the Massachusetts electoral ballot for the Democratic presidential primary election. Michael Connolly (Secretary of State) steps up to a spinning drum. He asks for volunteers to help him choose names from the drum. Connolly announces that the eve of the presidential primary elections is two months away. Connolly notes that the presidential primary is on March 13; that the state primary election is on September 18; that the presidential and state elections will be held on November 6. Connolly notes that the governor held a press conference in the morning about voter registration and voter participation. Connolly announces that he will draw the names of the eight democratic presidential candidates in order to determine their ballot positions on March 13. Connolly notes that Ronald Reagan (US President) will be the only candidate on the Republican ballot. Connolly draws the first name. Connolly announces that Jesse Jackson (Democratic candidate for US president) will be the first name on the ballot. Shot of the sign with the image of the electoral ballot. Jackson's name is put on the first line of the ballot. Connolly invites Thomas Fitzgerald (state official) to draw the second name. Fitzgerald draws the name of Senator Gary Hart (Democratic candidate for US president). Shot of the sign with the image of the electoral ballot. Hart's name is put on the second line of the ballot. Connolly draws the name of Reubin Askew (Democratic candidate for US president. Paul Williams (state official) places Askew's name on the third line of the large electoral ballot. Paul Williams draws the name of George McGovern (Democratic candidate for US president). Williams places McGovern's name of the fourth line of the large electoral ballot. An older man pulls the name of Walter Mondale (Democratic candidate for US president). Williams places Mondale's name on the fifth line of the large electoral ballot. A male media photographer pulls the name of Ernest Hollings (Democratic candidate for US president). Williams places Hollings name on the sixth line of the large electoral ballot. Another man pulls the name of Alan Cranston (Democratic candidate for US president) . Williams places Cranston's name on the seventh line of the ballot and places the name of John Glenn (Democratic candidate for US president) on the eighth line. Shot of the sign with the image of the electoral ballot. Connolly says that there is approximately one month remaining for new voter registration. A reporter asks Connolly if Jackson's ballot position will be an advantage. Connolly says that he believes that the first ballot position is worth less than one percentage point. Connolly says that the voters are very familiar with the candidates. Connolly notes that Jackson is "on a roll"; that Jackson probably picked up supporters in his efforts to secure the release of Lieutenant Robert Goodman (US Navy) from Syria. A reporter asks Connolly which candidate he supports. Connolly says that he is endorsing Mondale. Connolly says that the presidential candidates are well-known; that the some candidates are more visible than others; that ballot position should have little effect on the outcome of the election. Connolly says that he is trying to raise voter awareness today; that he wants more people to register to vote. A reporter asks Connolly if he will be a candidate for US Senate. Connolly says that he expects to be a candidate for US Senate; that he will not yet announce his candidacy in deference to Paul Tsongas (US Senator). Connolly closes the press conference. Shots of the enlarged electoral ballot. 1:08:21: V: Shot of the exterior of Connolly's office. There is a holiday wreath on the door. The letters on the door read, "Michael Joseph Connolly, Secretary of the Commonwealth." Kate McGrath (WGBH reporter) stands outside of Connolly's office. McGrath notes that Connolly reminded voters that there are four weeks left to register for the presidential primary. McGrath reports that Jackson's top ballot spot may generate interest in the election among unregistered voters. McGrath does several takes of her close to the story. Description: Christy George reports from Atlanta on African American residents' views of the Democratic presidential ticket and the Democratic National Convention. George notes that Michael Dukakis needs to show African American voters that he wants their support. Interviews with employees and customers at the Auburn Rib Shack. The interviewees support Jesse Jackson and hope that Jackson will be named as Dukakis's running mate. George notes that both Dukakis and Lloyd Bentsen have good records on civil rights and that Jackson's supporters may be waiting for Jackson to throw his support behind Dukakis. Interviews with African Americans in Atlanta about Jackson and Dukakis. Many interviewees are skeptical about Dukakis. George's report also features footage of Jackson speaking to an audience and footage of Dukakis addressing the Democratic National Convention. 1:00:21: Visual: Footage of James Wyatt (Atlanta resident) driving his cab in Atlanta. Wyatt talks about how life has changed in Atlanta since the civil rights movement. Christy George reports that Wyatt is 84 years old; that he has been driving a cab for 52 years. V: Footage of Wyatt talking about how is mother used to work in the cafeteria of a white school. Wyatt says that she would bring the leftovers home to him. Footage of Jesse Jackson (African American leader) addressing an audience. Jackson talks about how his mother could not prepare a Thanksgiving meal for his family. Jackson say that his mother was busy serving another family's meal. Footage of Wyatt saying that he would have liked to have seen Jackson as the Democratic nominee or as the running mate of Michael Dukakis (Democratic nominee for US President). Christy George stands in front of the Auburn Rib Shack in Atlanta. George reports that Dukakis needs to ask African American voters what they want. V: Footage of an African American female working behind a counter in a restaurant. The woman says that some voters may vote for the Republican ticket if they are disappointed in the Democratic ticket. Footage of an African American male saying that many voters will be upset if Jackson is left off of the Democratic ticket. Shot of an African American man working in the kitchen of the Auburn Rib Shack. George reports that workers and customers at the Auburn Rib Shack are hoping that Jackson will named to the Democratic ticket. V: Footage of an African American man saying that many African Americans registered to vote in order to vote for Jackson. Footage of Dukakis speaking from a podium at the Democratic National Convention. Jackson and Lloyd Bentsen (US Senator) stand on each side of Dukakis. Dukakis says that he wants Jackson and his supporters to play a major role in the presidential campaign. George reports that Dukakis and Bentsen both have good civil rights records. George notes that African American voters may be waiting for Jackson to throw his support behind Dukakis. V: Footage of an African American woman in the driver's seat of a car. The woman says that Jackson deserves a chance. Footage of an African American woman saying that it is time for a change; that the US is ready for an African American candidate. 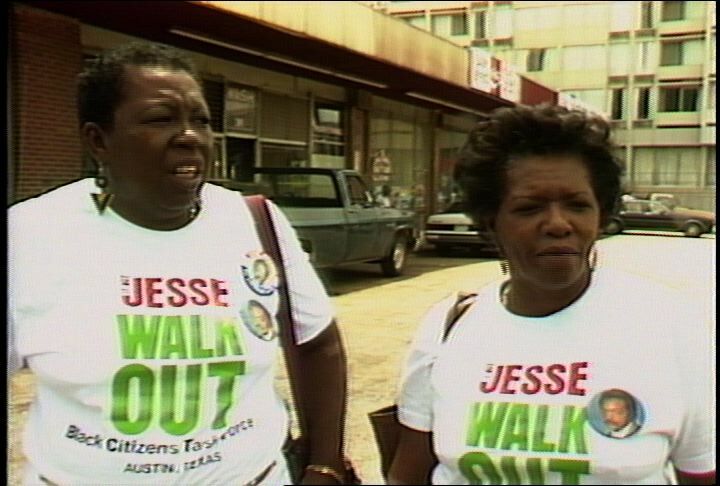 Footage of two women wearing T-shirts which read, "Jesse Walk Out." The women say that Dukakis should go back to Massachusetts. Footage of Wyatt talking about Dukakis. Wyatt says that he has not heard much about Dukakis; that the Democratic Party needs a good leader. Shot of Wyatt's cab turning a corner. Description: Christy George reports from the Democratic National Convention in Atlanta. George reports that Atlanta is the heart of the new South; she adds that the region is becoming more diverse, and has been energized by an influx of industry and culture. George reports that the Mississippi Delegation to the Democratic National Convention is said to lead the region on issues of race relations. George notes that the Mississippi delegates are representative of the new South. Interviews with Mississippi delegates Jesse Banks, Ed Cole, Isaiah Frederides, Sherry Fisher, Deborah Dunn and Joe Gaitlin. Each delegate expresses pride in the political process and talks about the changes in the state of Mississippi. George reviews the struggle by African Americans for inclusion in the Democratic Party. George discusses the history of African Americans at the Democratic National Convention from 1948 to 1968. George's report includes footage of civil rights protesters in the 1960s and footage of the Democratic National Convention in the 1960s. 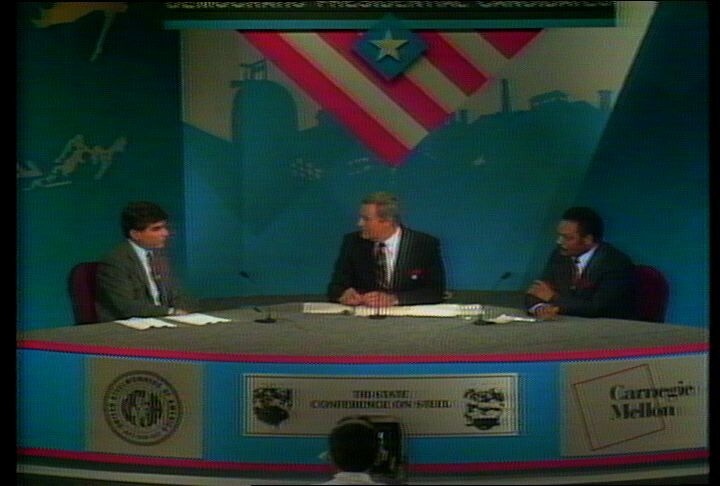 George's report is also accompanied by footage of Jesse Jackson at the 1988 Democratic National Convention. George notes that Jackson has led a new group of people into the Democratic Party. 1:00:16: Visual: Black and white footage from Eyes on the Prize of Fannie Lou Hamer (Mississippi Freedom Delegation) at the Democratic National Convention in 1964. Black and white footage from "Eyes on the Prize" of African Americans exiting a bus; of white political officials. Shots of a uniformed man taking American flags from the hands of African American demonstrators; of African American demonstrators marching with American flags. Shots of a Democratic National Convention from the 1960s. Christy George reports that African Americans have been fighting for inclusion in the Democratic Party since 1948; that white delegates from Mississippi and Alabama walked out of the convention in 1948 to protest a civil rights plank in the party platform. George notes that the Mississippi Freedom Delegation was seated at the Democratic National Convention in 1968. 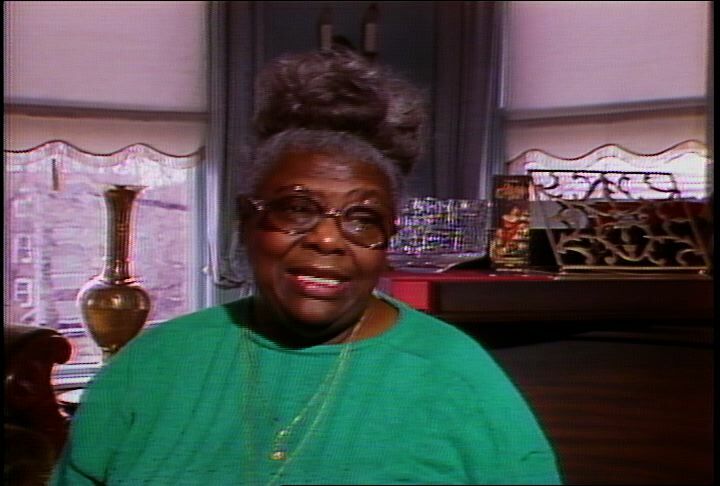 V: Footage of Jessie Banks (resident of Tchula, Mississippi) talking about the seating of the Mississippi Freedom Delegation at the 1968 convention. George reports that Banks is now a Mississippi delegate to the Democratic National Convention; that the Mississippi delegation is said to lead the South on the issue of race relations. V: Shot of the Mississippi delegation on the floor of the 1988 Democratic National Convention. Footage of Jesse Jackson (African American political leader) addressing the convention on July 19, 1988. Jackson announces that Ed Cole (Mississippi delegate) is the leader of the Mississippi delegation; that Cole is African American. Shots of Jackson exiting a building. He waves to voters. A bus awaits Jackson. A banner on the bus reads, "Rainbow voter registration campaign." Jackson stands in the entrance to the bus, waving to supporters. George reports that Jackson has a led a new group of people into the Democratic Party. V: Footage of State Representative Isaiah Frederides (resident of Gulfport, Mississippi) says that his mother was a domestic servant; that his mother was fired from her job when he tried to register to vote; that his father-in-law's job was threatened. Frederides says that he and his wife were the first two African Americans to register to vote in his county. Footage of Sherry Fisher (resident of Vicksburg, Mississippi) saying that she is attending a convention for the first time; that she wants to be a part of the US democracy. She says that it feels good to be a part of the changes in Mississippi and the US. Shot of delegates on the floor of the 1988 convention. George says that the "new South" is focused on sharing power between those of common backgrounds. 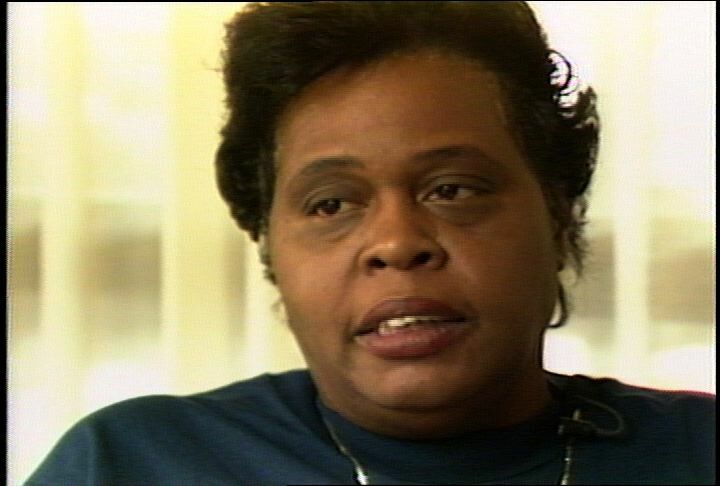 V: Footage of Deborah Dunn (resident of Bruce, Mississippi) being interviewed by George. Dunn says that she is a white woman who has picked cotton and worked hard for what she has. Dun says that all southerners are proud of what they have achieved. Footage of Jackson addressing the 1988 Democratic National Convention. Jackson calls Atlanta the "crucible of the new South." V: Shots of the Atlanta skyline; of construction workers working on a new building in Atlanta. George reports that Atlanta is becoming a major urban center. V: Footage from WNEV-TV of an Atlanta Hawks basketball game. Footage of Joe Gatlin (resident of Laurel, Mississippi) saying that industry has come to Atlanta from the north; that industry has brought culture and diversity. Gatlin says that the South is diversifying while keeping some of its old values. Shots of the Atlanta skyline. George reports that diversity and new people may energize the Democratic Party as it is energizing the South. V: Footage of Banks saying that she has great hope for the nation; that the Democratic Party has great African American and white leaders. Christy George stands in downtown Atlanta. George reports that African Americans and whites live in harmony and prosperity in Atlanta; that the Democratic Party will begin to understand the "new South" after holding its convention in Atlanta. Description: Marcus Jones reports that Jesse Jackson traveled to Iraq and Kuwait last weekend in order to interview Saddam Hussein. Jackson traveled to Iraq as a journalist, but also managed to secured the release of US citizens trapped in the US embassy in Kuwait. Jones' report includes footage from Inside Edition of Jackson's meeting with Hussein and his return from Iraq. Interview with Urban Update producer Alicia Hilliard about media coverage of the Persian Gulf crisis and the minority perspective on the Persian Gulf crisis. 1:00:06: Visual: Footage from the TV show Inside Edition, including Inside Edition graphics. 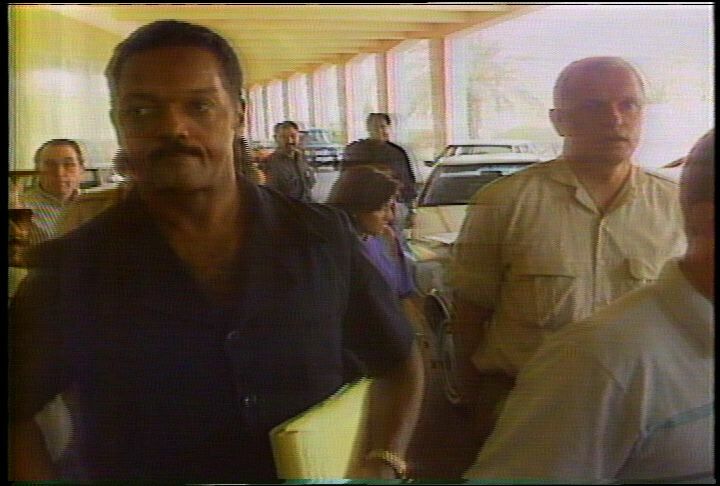 Shots of Jesse Jackson (African-American political leader) in Iraq; of Jackson on a plane; of Jackson exiting the plane. Shot of Jackson entering a building. Marcus Jones reports that Jackson was identified as a reporter on the TV news magazine Inside Edition. Jones reports that Jackson traveled to Iraq and Kuwait last weekend; that Jackson's activities were not those of a conventional journalist. V: Footage from Inside Edition. Jackson meets with Saddam Hussein (Iraqi leader). The two men speak through a translator. Jackson and Hussein talk about women and children who will return to the US with Jackson. Jones reports that Jackson interviewed Hussein; that Jackson secured the release of US citizens trapped in the US embassy in Kuwait. V: Shots of a US family; of Jackson standing with the US family. Jones reports that Jackson was treated as a welcome guest; that Jackson responded in kind. V: Footage from Inside Edition. Shots of a Iraqi man in military uniform. Shot of Jackson greeting a security guard on the other side of a glass window. Shots of Jackson at the airport with US citizens who traveled with him from Kuwait. The media takes photographs. Shots of two girls greeting a relative at the airport. Jones reports that a Wall Street Journal/NBC poll shows that most African Americans approve of Jackson's direct and personal approach to resolving the Persian Gulf Crisis. Jones notes that the same poll shows that most white Americans believe that a show of US military might will resolve the crisis. V: Shots of Jackson meeting with Hussein; of Hussein during the meeting. Footage of Alicia Hilliard (producer, Urban Update) being interviewed by Jones. Jones asks about the minority perspective on the Persian Gulf Crisis. Hilliard says that African Americans may sympathize with Kuwaitis and Iraqis because Kuwaitis and Iraqis are people of color. Hilliard wonders whether African American and other minority US soldiers will feel comfortable shooting at Kuwaitis and Iraqis. Hilliard says that the mainstream media ignores this angle. Jones reports that Hilliard is the producer of Urban Update on WHDH; that Urban Update focuses on minority issues and perspectives. Jones reports that Hilliard says that the mainstream media has ignored the minority perspective on the crisis. V: Footage of CBS Evening News coverage of the Persian Gulf Crisis. Shot of Dan Rather (CBS News anchor) reading the news. Footage of Hilliard being interviewed by Jones. Hilliard says that the media is not sensitive to those who differ from the norm. Hilliard says that "people do not relate to people who are different." Jones reports that Jackson counts himself among the minority of African Americans who support Bush's military build-up in the Persian Gulf. V: Footage of Jackson being interviewed on the set of Inside Edition. Jackson says that war becomes inevitable if talking is impossible. Inside Edition graphics and closing credits. 1:00:22: Visual: Footage from CBS of Lloyd Bentsen (Democratic US vice-presidential candidate) being interviewed on October 26, 1988. Bentsen says that there are elements of racism in the campaign. Meg Vaillancourt reports that race has become an issue in the presidential election; that Democrats claim that Republican campaign advertisements are racist. Vaillancourt notes that Republican accuse Democrats of racially divisive tactics. V: Footage of the Reverend Earl Jackson (Black Republican Council) addressing a meeting of the Black Republican Leadership Council in Roxbury. Shots of the audience. Jackson accuses Michael Dukakis (Democratic US presidential candidate) of hypocrisy. Jackson remarks that Dukakis has kept his distance from the African American community during the campaign; that Dukakis is now accusing George Bush of racism (Republican US presidential candidate). Shots of an African American neighborhood; of African American female shopper. Vaillancourt reports that the African American community has traditionally voted Democratic; that younger African Americans have doubts about Dukakis. V: Footage of an African American female saying that she will vote Republican this year because Dukakis is not a good candidate for president. Footage of another African American female saying that she would vote for Bush because he seems like an honest man. Footage from CNN of Dukakis, Kitty Dukakis (wife of Dukakis), Jesse Jackson (African American political leader), and Jaqueline Jackson (wife of Jackson) with other Democratic Party leaders at the 1988 Democratic National Convention; of delegates at the convention. Vaillancourt reports that Dukakis is not running as strongly with African American voters as previous Democratic candidates. Vaillancourt reports that a poll has found younger African American voters to be more open to Republican overtures. V: Shots of the meeting of the Black Republican Leadership Council; of the attendees. Footage of Ed Reed (Black Republican Council) saying that Bush will make an effort to increase minority participation if elected. Vaillancourt reports that some African Americans are supporting Bush because they want to support the winner. V: Shots of African Americans residents on the streets of Roxbury. Footage of an African American man saying that Dukakis doesn't have what it takes to win. Vaillancourt reports that African American voters may not be convinced by the Republican Party's position on economic issues. V: Footage of an African American woman saying that she will vote for Dukakis because she is a poor, African American woman. Shots of a voter registration table in Dorchester. African American workers register African American residents to vote. Vaillancourt notes that many African American voters seem angry at Dukakis. V: Footage of an African American male saying that he is angry at Dukakis for not choosing Jackson as his vice-president. Footage of an elderly African American woman saying that she remembers when the candidates were nice to poor people. Footage from CNN of Michael Dukakis, Kitty Dukakis, and Euterpe Dukakis (mother of Michael Dukakis) at the Democratic Convention. Vaillancourt reports that Dukakis may be alienating traditional Democratic voters by trying to appeal to a wider spectrum of voters. Vaillancourt notes that the African American community is still a Democratic stronghold. V: Shots of African American residents on the streets of Roxbury. Footage of Janice Thurmond (Dukakis campaign) being interviewed by Vaillancourt. Thurmond says that young African Americans take civil rights for granted. Thurmond says that Dukakis represents justice and a sense of fair play. Description: Meg Vaillancourt reports that Jesse Jackson has challenged Michael Dukakis to come out with a budget for his proposed domestic programs, during a campaign debate. Dukakis has refused to release a budget so far. Interview with Issues Dirextor for the Dukakis campaign, Christopher Edley, who says that Dukakis is an experienced chief executive and that he does not need to release a budget during a presidential campaign. Vaillancourt reviews Dukakis's proposals on day care, affordable housing, and drugs. She notes that he has not talked about a budget for these proposals. Interview with community activist and Jackson supporter Mel King, who also supports Jackson in his demand for Dukakis's budget. Dukakis has talked about funding for his education proposals and for his "Rebuild America" proposal. Vaillancourt reviews Dukakis' budget priorities and notes that he would fund increases in domestic funding through cuts in the defense budget. Vaillancourt reviews the events of Dukakis's first term as Governor of Massachusetts. She notes that a massive state debt forced Dukakis to raise taxes and cut spending. 1:00:02: Visual: Footage of Jesse Jackson (Democratic US Presidential candidate) and Michael Dukakis (Democratic US Presidential candidate) at Steel Valley Debate in Pennsylvania. Jackson says that "Reaganomics" must be reversed. The audience applauds. Meg Vaillancourt reports that Jackson has challenged Dukakis to come up with a budget detailing which domestic programs need support and how Dukakis would pay for them. Vaillancourt notes that Dukakis has stuck to his own script; that he has refused to enter into a budget battle with Jackson. V: Footage of Dukakis at the debate. Dukakis says that partnerships between Washington DC, management, and labor need to be built. Vaillancourt reports that public-private partnerships are the key to Dukakis's domestic programs. V: On-screen visuals and text detail Dukakis's positions on day care, affordable housing, and drugs. Vaillancourt reports that Dukakis has called for "'a national partnership to create affordable day care for all'"; that Dukakis's position paper carries no price tag for his day care program. Vaillancourt reports that Dukakis supports a reallocation of money to build more affordable housing; that Dukakis's position paper carries no price tag for the affordable housing program. Vaillancourt reports that Dukakis would fight drugs by restoring funds to the Coast Guard and to other enforcement measures; that Dukakis's position paper carries no price tag for his anti-drug program. V: Shot of Jackson at the campaign debate. Footage of Christopher Edley (Issues Director for the Dukakis campaign) being interviewed by Vaillancourt. Edley says that Dukakis is an experienced chief executive; that Dukakis has put together ten balanced budgets in his tenure as Governor of Massachusetts. Edley says that an electoral campaign is not the time to put together a budget. Footage of Mel King (Jackson supporter) saying that the voters need to know about Dukakis's priorities; that voters need to know where Dukakis will find the money to implement his programs. Vaillancourt notes that Dukakis has talked about the budgets for two of his programs. V: Shots of Dukakis and Jackson at the campaign debate. On-screen text and visuals detail Dukakis's positions on job creation and education. Vaillancourt reports that Dukakis's "'Rebuild America'" program would "invest $500 million from federal government to regional development." Vaillancourt reports that Dukakis supports increasing the education budget by $250 million in his first year. Vaillancourt reports that Jackson would raise taxes on corporations and the wealthy to pay for his domestic programs; that Dukakis would like to generate additional money by cracking down on tax cheats and by making the government more efficient. V: Shots of Dukakis and Jackson at the campaign debate. On-screen text and visuals detail Dukakis's budget priorities. Vaillancourt reports that Dukakis will "finance all new domestic spending through cuts in Star Wars." V: Shot of King being interviewed by Vaillancourt. Footage of Dukakis speaking at a press conference in 1974. Vaillancourt reports that Dukakis promised no new taxes in his first campaign for governor of Massachusetts in 1974; that the massive state debt forced him to raise taxes and to cut spending. V: Footage of King being interviewed by Vaillancourt. King says that Dukakis has not learned the lesson of 1974; that Dukakis has not honored his commitments to meet the needs of people on welfare. King says that voters need to know where the money will come from for his programs. Vaillancourt notes that Dukakis probably does not want to quote specifics in order to avoid becoming the captive of special interest groups. V: Shot of Dukakis at the campaign debate. 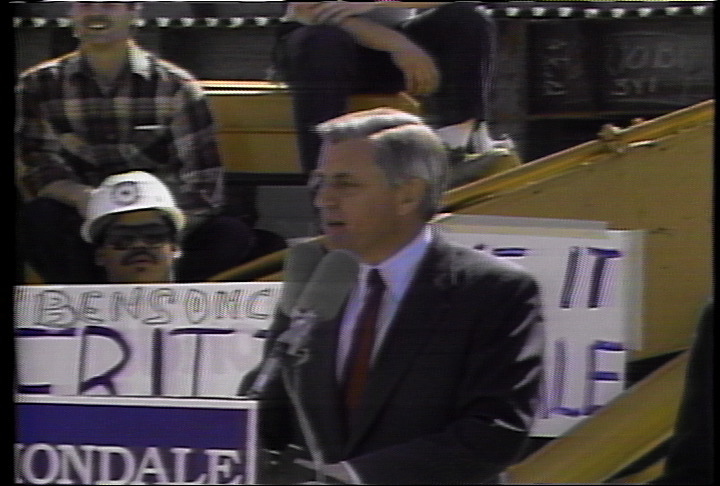 Footage from C-Span of Walter Mondale (1984 Democratic US Presidential candidate). Vaillancourt reports that Dukakis has avoided giving Jackson specifics outside of the areas of job creation and welfare reform; that Dukakis has left himself room to maneuver in the general election. 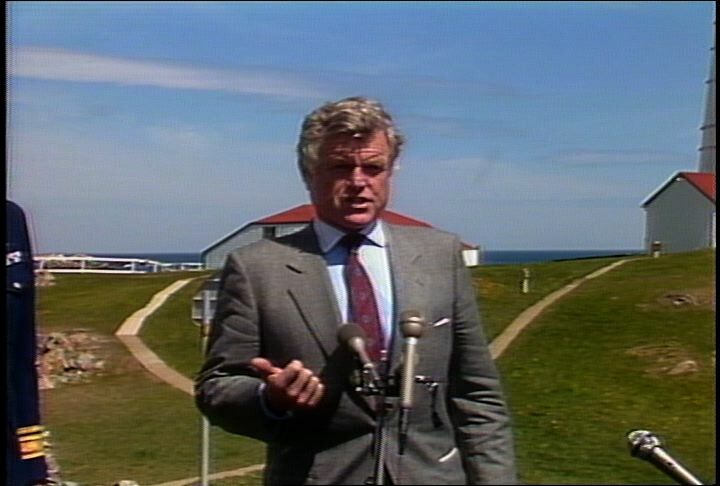 Description: David Boeri reports that Senator Edward Kennedy took a cruise on a Coast Guard boat to Little Brewster Island in Boston Harbor. Little Brewster Island is the site of a lighthouse that was repaired with funds procured by Kennedy from the federal government. Funding for the Coast Guard has been cut by the federal government, resulting in closed facilities and fewer patrols. Interview with Robert Johanson, Rear Admiral of the US Coast Guard, about the budget cuts. Kennedy and Jesse Jackson have called for a restoration of funds to the Coast Guard. Coast Guard patrols can stem the flow of drugs into the US. Jackson talks about the Coast Guard. Kennedy on Little Brewster Island. 1:00:10: Visual: Footage of Edward Kennedy (US Senator) shaking hands with a Coast Guard officer on board a boat. Shot of a Coast Guard boat cruising in Boston Harbor. Shot of Kennedy with a cigar, walking toward the lighthouse on Little Brewster Island. Shots of the lighthouse. Shots of the Boston skyline from Little Brewster Island. David Boeri reports that Kennedy took a boat cruise with a crew of Coast Guard officers and reporters; that Kennedy was trying to draw attention to his legislative record on Boston Harbor; that the boat brought Kennedy to visit the lighthouse on Little Brewster Island in Boston Harbor. Boeri notes that the lighthouse was repaired with funds from an amendment that Kennedy tacked on to an appropriations bill two years ago. Boeri notes that the the lighthouse marks the entrance to Boston harbor; that the lighthouse is still operational. Boeri adds that other lighthouses have been closed recently. V: Footage of Kennedy on Little Brewster Island. Kennedy says that light stations have been closed for budgetary reasons; that reduced services are the result of budget-tightening measures. Boeri reports from Little Brewster Island. The lighthouse is visible behind him. Boeri reports that Ronald Reagan (US President) and the Congress made cuts in the Coast Guard budget in 1988; that the Coast Guard has closed facilities. Boeri adds that the Coast Guard is running fewer patrols as a result of cuts in the budget for fuels, parts, and maintenance. Boeri reports that search and rescue patrols and fisheries enforcement patrols have been eliminated. V: Shot of a Coast Guard boat in Boston Harbor. Footage of Robert Johanson (Rear Admiral, US Coast Guard) saying that the Coast Guard has cut back on law enforcement patrols; that an increase in drug trafficking could be the result. Shot of a Coast Guard officer driving a boat. Boeri reports that the cuts in law enforcement patrols have provoked some to call for a restoration of money to the Coast Guard budget. V: Footage of Jesse Jackson from October 5, 1987. Jackson says that the Coast Guard needs to be stronger; that the Coast Guard can prevent the flow of drugs to the US. Footage of Kennedy on Little Brewster Island. Kennedy calls for a restoration of money to the Coast Guard budget. Boeri reports that Kennedy has called for Congress to transfer an additional $60 million to the Coast Guard budget. Shot of the Boston skyline from Little Brewster Island. 1:00:07: Visual: Footage of Raymond Jordan (Dukakis delegate) being interviewed by Christy George. Jordan says that he is working to unite all Democrats behind the nomination of Michael Dukakis (Democratic US Presidential candidate). 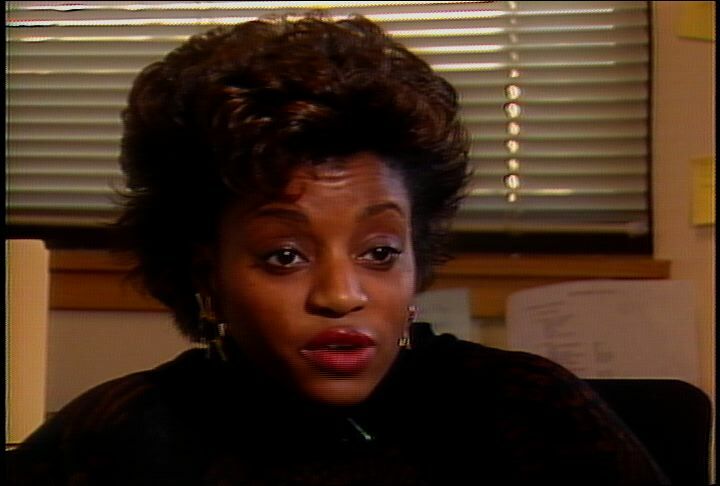 Footage of Saundra Graham (Jackson delegate) saying that Jesse Jackson (Democratic US Presidential candidate) has broken the barrier which had kept people of color from running for elected offices. George reports that the Jackson campaign and the Dukakis campaign have different agendas for the Democratic Convention in Atlanta next week. V: C-Span footage from the 1984 Democratic National Convention. Dianne Feinstein (US Senator) urges the members of the Democratic Party to put aside their differences in order to work for their goals. Shot of Democratic leaders including Jackson shaking hands at the the Convention. Shots of construction workers preparing the set and stage for the 1988 Democratic National Convention. George reports that Jackson may not support Dukakis's choice of running mate; that Jackson wants to be Dukakis's running mate. V: Shot of Dukakis and Lloyd Bentsen (US Senator) at a press conference. Footage of Jordan saying that Dukakis supporters are going to the convention to support Dukakis. Footage of Graham saying that Dukakis needs to accomodate Jackson supporters. George reports that Jackson is threatening floor fights on all 13 platform issues that he does not win. V: Shot of Jackson speaking from a podium. Footage of Jordan saying that Dukakis has done everything he can to accomodate Jackson on the platform issues. Footage of Graham saying that she is going to the convention to fight for the issues which are important to her and her constituents. George reports that Jackson is threatening to give his speech outside of the convention hall if he feels mistreated by the Democratic Party leadership. V: C-Span footage of Jackson addressing the 1984 Democratic Convention. Shot of the audience. Footage of Jordan saying that Jackson's attitude is "political posturing." Jordan says that no one knows what Jackson's real motives are. Footage of Graham saying that Dukakis is acting unreasonably; that Dukakis is trying to control the convention rules and the party platform. George speculates as to whether Jackson supporters and Dukakis supporters will unite at the convention. V: Shots of Dukakis standing at the shore of a lake; of Jackson addressing a small crowd; of the convention set being constructed in the Atlanta convention center. Footage of Graham saying that Jackson needs to urge his supporters to support Dukakis as the Democratic nominee. Footage of Jordan saying that Jackson supporters and Dukakis supporters both want the Democratic nominee to win the presidency. George notes that the convention could be boring if both sides unite immediately behind one candidate and one platform. Description: A quick recap of the way the Democratic party has been moving since the 1968 National Convention and how Mondale is doing now. Footage from the Democratic convention in 1968, Gloria Steinem speaking in 1972, Jimmy Carter at the convention in 1972, Mondale on the campaign trail and speaking at a Union rally, introducing Geraldine Ferraro, shots of Ferraro on the campaign trail, Jesse Jackson, people campaigning for Gary Hart, people waiting for a train. Reporter voice-over throughout. Sound.